Made of 3/8 diameter braided stainless steel. Braided sesigned for maximum durability. 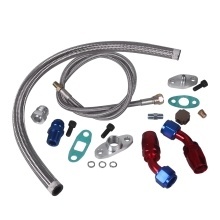 Inlet adaptor with limit oil flow design, nuts, bolts, and gaskets included. High quality adaptors, made to specific sizes.